Maximum power for a new generation of eurorack modules. A serious double row, 208hp powered eurorack travel case with detachable lid. Includes a heavy duty, rock solid power supply reliable enough for the toughest tour schedule. 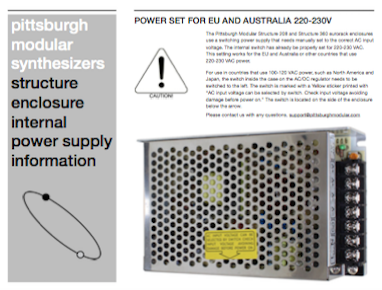 Internal Lid Depth: 2 3/4"
Installing modules into a Pittsburgh Modular Structure case is easy. Click on the installation guide below for a simple walkthrough of the 5 step process. WARNING! ALWAYS TURN OFF AND UNPLUG THE CASE BEFORE ADDING OR REMOVING MODULES. Incorrectly installed modules can cause damage to the case and other modules. Double check the orientation of the power ribbon cable before plugging in and turning on the case. WARNING! ALWAYS FILL UNUSED PANEL SPACE WITH BLANK PANELS. Stray patch cables touching the power headers can cause damage to the case and modules. Always cover empty rack spaces with blank panels. WARNING! Not all modules will fit snug against the left and right walls of the case. The design of the rail bracket requires 2mm of space on either side of the case 26mm below the panel. This allows us to offer a 120hp (610mm) of space from wall to wall without a visible bracket while still offering the strength and stability of a metal bracket. Depending on the design of the module, the 2mm on either side of the case, 26mm below the panel could effect the placement of deeper modules which utilize the full width of the panel for their PCB and prevent their placement up against the side of the case without leaving a small gap.